Nine years ago, I got (over)excited about working out the Forum Ranks (and posting stats for each rank). Now that I've become an administrator, I kind of can't really do that any more, but I've been wondering about what sort of forum ranks the various subforums at The Piazza might have for a while. There is no system for this, so I thought I'd invent one, for my own amusement. I'm going to post it so that anyone nerdy enough to want to follow what I'm doing can have a look. Replies are as important as topics (if not more so) so I'm going with a baseline of "ten replies per topic". I will edit the above table, and add more levels, if I need to, but you should be able to work out the progression from that. The nerdy "Forum Levels" will be posted in the next post (after I work them out). Last edited by Big Mac on Tue Jun 19, 2018 2:15 am, edited 2 times in total. I like that you are including both threads and total posts. I remember being very frustrated at another website back in the days for insisting that only the number of threads should be used in determining status of forums. That meant that forums with lots of long and interesting discussions was actually being punished for that. Glad we are not taking that route! Havard wrote: I like that you are including both threads and total posts. Well it's only a fun thing anyway. But if I was going to go on just one thing, I'd go on post count, rather than topic count. No consideration for the number of views as well??? Here is the table that explains the forum levels. I might come back and edit this post and add another version of the top table, with the forums sorted by level (highest to lowest). Last edited by Big Mac on Sun Jun 17, 2018 3:14 pm, edited 4 times in total. Yaztromo wrote: No consideration for the number of views as well??? I think that is only visible on individual topics. But feel free to make your own topic and sit down with an adding machine to work out what the views would be. Big Mac wrote: I might come back and edit this post and add another version of the top table, with the forums sorted by level (highest to lowest). I just did. See the previous post. Thanks Big Mac.. for answering Big Mac's question. I love this kind of stuff. Thanks for sharing! Tim Baker wrote: I love this kind of stuff. Thanks for sharing! One forum has already "levelled up" since I posted this. I used to go to nerdy lengths trying to reverse-engineer Ashtagon's forum ranks (but when she made me into a Junior Administrator I stopped doing that). 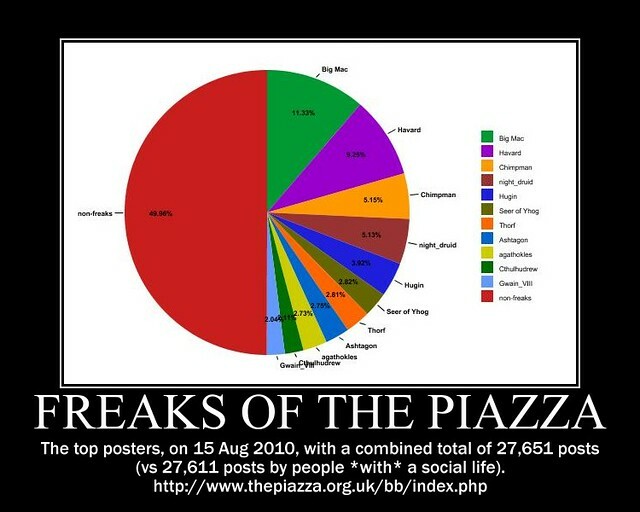 And I once worked out a pie chart of the top posters on the forum. Big Mac wrote: I once worked out a pie chart of the top posters on the forum. I love visualizations like that. So 12 people generated nearly half the posts as of 7 years ago? That's crazy! Tim Baker wrote: So 12 people generated nearly half the posts as of 7 years ago? That's crazy! Yes. That's correct. You can look at the memberlist sorted by post count if you want to try to repeat the calculations I used to make that chart. No social life, huh? That's fighting talk! Alzirus (0.11 ppd) might stay ahead of you for a while, but I think you will eventually catch him. But Mike Myler also has 0.29 ppd, so I think you will struggle to ever catch him. Sarastro Magnifico has 0.21 ppd, so you will probably catch him eventually, but not too quickly. Everyone else ahead of you on your page is also listed as 0.04 ppd, so if you want to prove you have no social life, and get onto page 6 of the leaderboard, you might be able to do it, assuming there are some slow people on page 6 that you and Mike Myler can steal the slots from. Big Mac wrote: No social life, huh? That's fighting talk! I assume ppd is posts per day? The other is that my work varies between "working flat out with no time to look at the PC with internet access" and "spend (nearly) all day on the internet because I have nothing to do" (our part of the project is effectively done so we spend most of our time waiting on others). Now this latter sounds good, but my work PC usually gets a network access error on these forums whenever I browse into a sub-forum, something it doesn't seem to do anywhere else. It's not a blocked website as that is a different message (found that out with Project Gutenberg), it just rarely works from my office. It could be something to do with the routing as the network portal is usually in Germany even though I work int he UK (which really messes up listening to the cricket on the BBC). So yes, just because I don't spend my life posting on here doesn't mean I have a social life (one of the reasons why I grabbed a custom forum title last year) but I will see what I can do to rectify my miserly post count. Yes it is. I abbreviated it. The forum writes it in full. Giant in the Playground do some cool stuff. I don't blame you for hanging out over there. And there is nothing wrong with a bit of lurking. But it is nice when people delurk and you can have a chat with them. Khedrac wrote: The other is that my work varies between "working flat out with no time to look at the PC with internet access" and "spend (nearly) all day on the internet because I have nothing to do" (our part of the project is effectively done so we spend most of our time waiting on others). Now this latter sounds good, but my work PC usually gets a network access error on these forums whenever I browse into a sub-forum, something it doesn't seem to do anywhere else. It's not a blocked website as that is a different message (found that out with Project Gutenberg), it just rarely works from my office. It could be something to do with the routing as the network portal is usually in Germany even though I work int he UK (which really messes up listening to the cricket on the BBC). That's odd. I do occasionally get problems with a page on The Piazza loading, but if I immediately reload the page, it usually loads the second time. If you can try using a different browser, I would suggest giving that a go. Khedrac wrote: So yes, just because I don't spend my life posting on here doesn't mean I have a social life (one of the reasons why I grabbed a custom forum title last year) but I will see what I can do to rectify my miserly post count. I'm glad you got that title. Those custom titles are fun. But, seriously, it's more about cool ideas here, than post count. So if you have any great ideas, please do share them. WOW! I just found out I'm already in the second page!!! Yaztromo wrote: WOW! I just found out I'm already in the second page!!! Congrats! I just took a look and saw that I just made it onto the second page, too. When you start looking at the "posts per day" of the people above you, to see if you think you can catch them up, that's when it's time to join Postaholics Anonymous. When I look at the memberlist I can see the date of joining and the total post count, but I don't see a "posts/day" column - is there one in a view I am missing, or are people dropping this into a spredhseet and adding a calculated formula? Khedrac wrote: When I look at the memberlist I can see the date of joining and the total post count, but I don't see a "posts/day" column - is there one in a view I am missing, or are people dropping this into a spredhseet and adding a calculated formula? It's calculated on the Profile Viewer page, found by clicking on the user's name.